Feeling pretty good after being whisked away to ‘Neverland’, we decided its time to treat our tummies to one of New York’s famous street food. 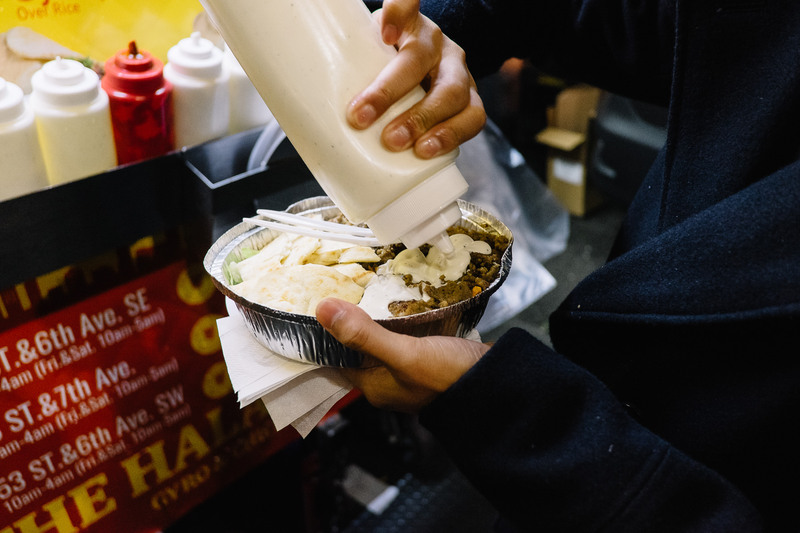 It was our second day in New York and for some reason that same day we’ve received many messages from friends that we HAVE to try Halal Guys. 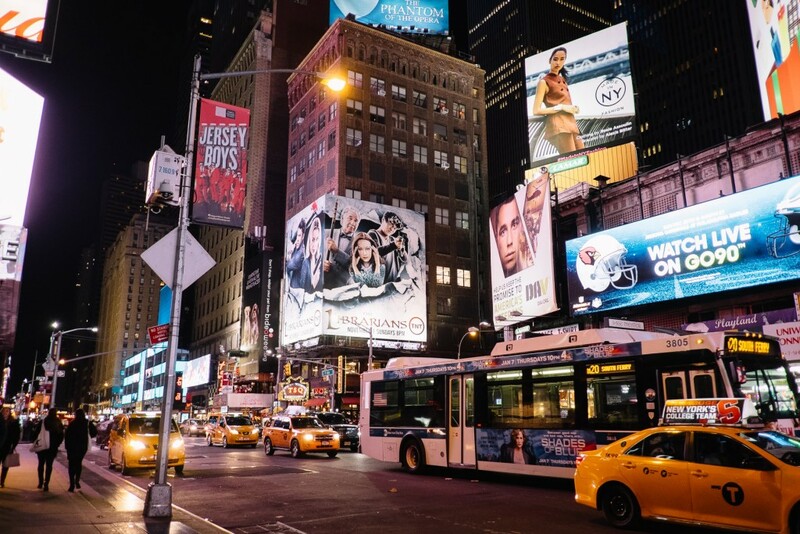 Spotted our favourite series in Times Square, The Librarians! 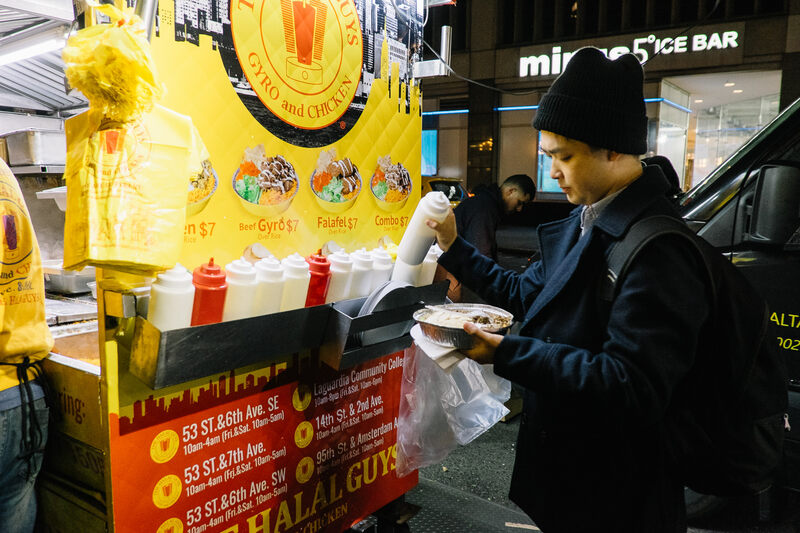 We don’t usually have supper (UNLESS we are in Singapore) but it was hard to ignore ‘Halal Guys’ on repeat in our heads. 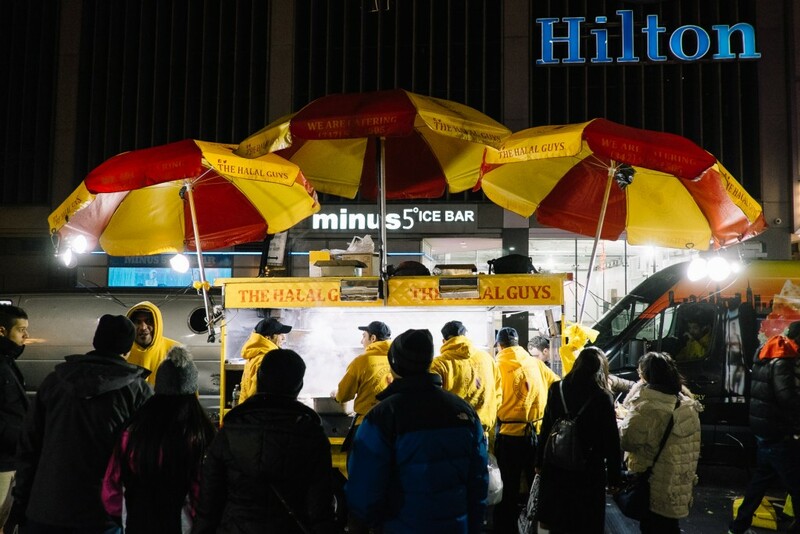 Rather than going to bed and dreaming of what Halal Guys might be about… we broke our no supper rule, braved the cold and joined the looong queue at one of their food carts outside Hilton’s Minus 5 Bar. 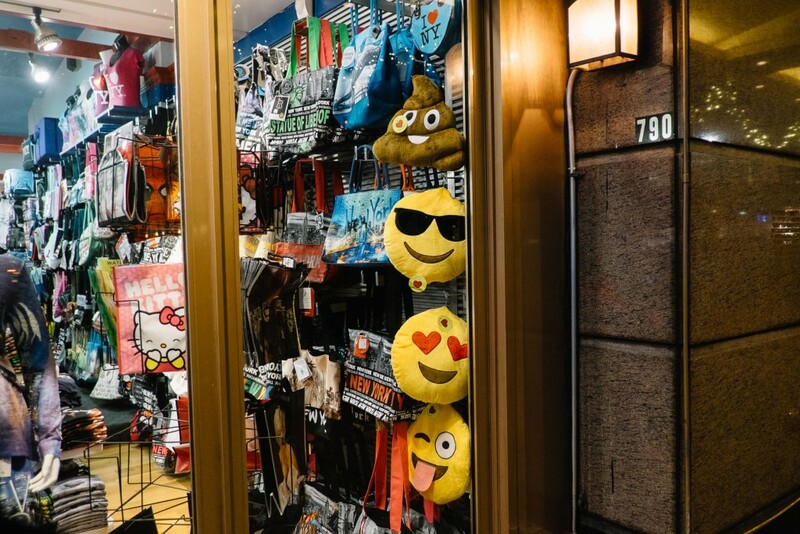 Is this why New York doesn’t sleep? Because good food keeps you out late at night? Walking around NYC you’ll see that there is no shortage of food carts that sell Halal food, we didn’t try any of those as we saved our calories for THE Halal Guys instead. They serve platters made up of rice, lettuce, carrots, tomatoes and a choice of chicken, beef or mixture of both with slices of pita bread on the side. If you don’t like the idea of rice, you could have all the above ingredients wrapped up like a gyro. They have a spicy sauce and a white sauce for you to cover the entire surface of your platter if you wish. We’re not too game on having the spicy, especially at that time of the night so went with the white sauce. It was like mayonnaise but not quite – the tangy flavour of the sauce definitely helps your appetite! It was at least 11:30pm by the time we had a hot platter in our freezing cold hands. Instead of shivering away in the cold while eating, we took a quick subway ride back to our hotel. We did make sure to have a few scoops of it before the train ride, while it was still hot. It was one of the moments where you would not stop after one spoonful. That is when you know it was worth breaking the no supper rule and eating past midnight. Luckily we bought one to share between two! Starting from $7 for a regular sized platter, it is pretty well priced considering I struggled to finish one to myself (on a later night). 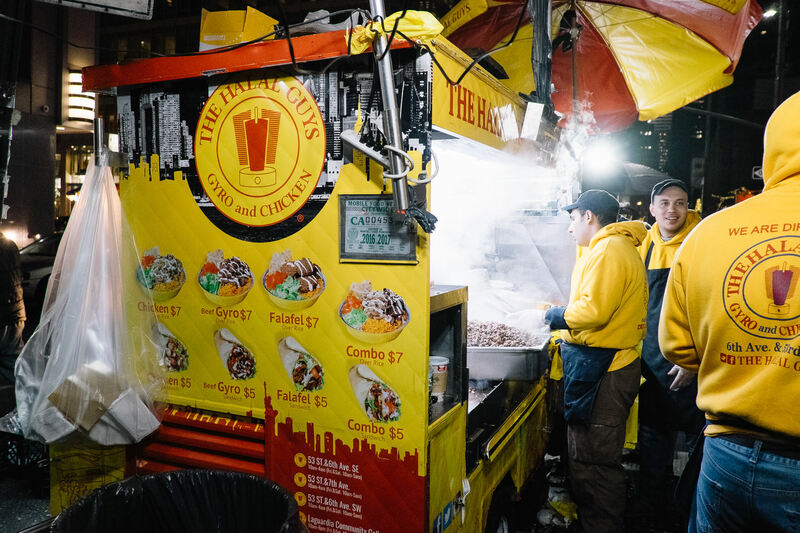 I’ll confess now that we had Halal Guys at least 3 times during our New York trip, and something that’s been on my mind ever since our last! 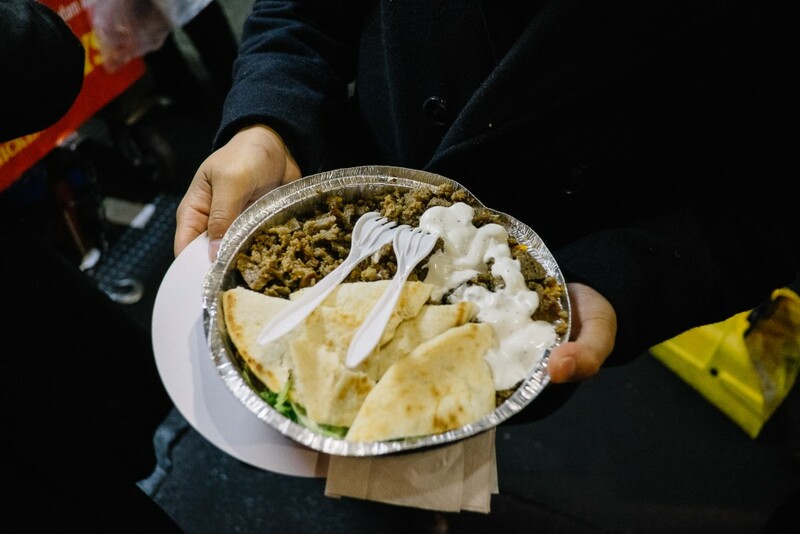 One day, I will fly back to New York just for another platter from Halal Guys… and try the gyro version!